Within the first hour of playing The Crew 2 I had screamed through the packed streets of downtown Washington DC in a frenetic street race, tore across the undulating dirt hills of New Mexico on a dirt bike, performed aerial stunts in my trusty aircraft over the Chicago skyline and then topped it all off with hotly contested boat race along the picturesque Miami coast. The Crew 2 then, is a like a massive bag of pick ‘n’ mix candy for racing fans – a cornucopia of deftly crafted racing bliss that has the entirety of the United States of America as its backdrop. Equally, The Crew 2 also embodies Ubisoft’s penchant for content stuffed, long-term progression and also somewhat sadly, their knack for appearing more out of touch with popular culture than my dad. 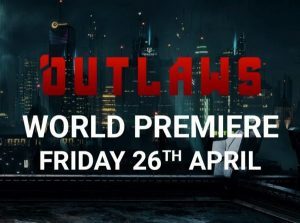 Ditching the cops and criminals theme of the original game, The Crew 2 has instead elected to go with the pursuit of social media fame for its sophomore entry in The Crew franchise. By swapping out Dominic Toretto for a racing version of PewDiePie, Ubisoft go all in on the idea of embracing social media. The problem is, the whole affair is handled with all the grace and nuance of All-Star Shouty Influencer Party 2018 and so comes off as spine-fracturingly cringeworthy as a result. Indeed, you need not look further than the aural violations perpetrated by The Crew 2’s set of vexatious narrators who frequently informed me that “there is nothing more awesome than gaining tons of new followers!”, or that I was on the cusp of attaining “legendary bassassdom” – a phrase that should absolutely be banned forever by the way and punishable in the Hague. At times, The Crew 2 can be a stunning looking effort. Once you’ve gotten past the trying presentation of The Crew 2’s social media beats, it becomes apparent that it’s more than just audiovisual presentation and that it also acts as the bedrock for The Crew 2’s numerous progression systems. In The Crew 2, you gain social media followers for completing races, special events and taking photos of Instagram worthy shenanigans, but more than just pure braggadocio, your follower count acts as an experience bar of sorts that when topped out, knocks you up a level which then opens up a veritable smorgasbord of new races and events for you to take part in. Luckily, this being a Ubisoft Game that presents you with a scaled map of the United States of America, there are no shortages of race and activity icons popping up all over the map, so the need to grind old events in order to access new ones is actually kept fairly minimal for much of the game. 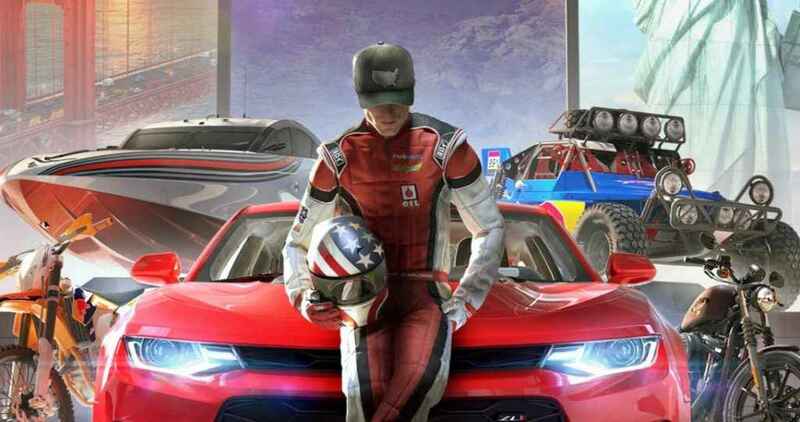 There are literally hundreds of different events to try too and in this sense, The Crew 2 offers more content than just about any other racer money can buy. Winning races, succeeding at events and taking cool photos also provides you with two different types of currency – regular cash and the aptly named Crew Credits, with the only difference between the two being that you can reach deep into your pockets and use real-life money to top up the latter. Rather than just sitting in a vault somewhere in Scrooge McDuck sized piles, all that moolah can be used to purchase vehicles that in turn can be used in various racing disciplines. From straight-laced sports cars that encompass recognizable names such as Aston Martin, through to hulking monster trucks emblazoned with Red Bull branding, The Crew 2’s diverse selection of racing opportunities is only really matched by the wide variety of vehicles that you can use to take part in them with. 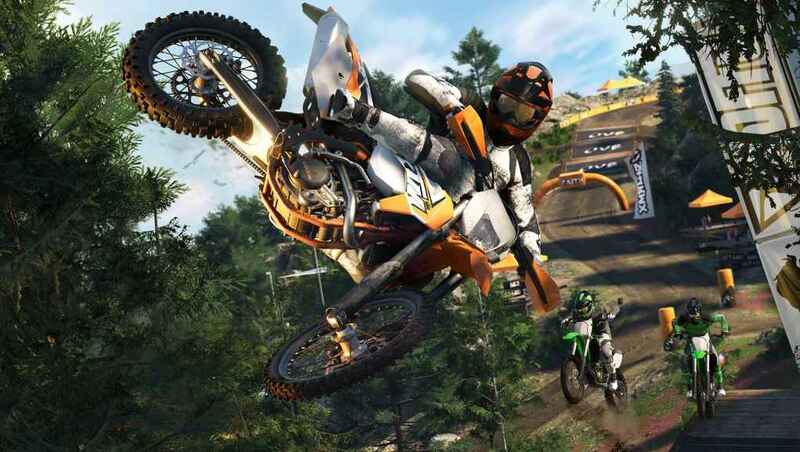 Motocross is just one of the many disciplines available in The Crew 2. Another benefit of completing objectives and generally not doing crap is that you will be rewarded with loot at the end of every event, with the quality of said gains increasing in potency if you elect to take part in these events on their higher difficulties – the latter of which requires your vehicle to be properly attuned and capable in the first place. Once collected, loot manifests itself as parts of varying qualities that can be used to boost the performance of the vehicle which you used to win the race in a number of different ways, ranging from buffing acceleration and top speed, through to handling and drift capability to name just a few. On the face of it, this sort of loot collection for incremental gain should be a cynical turn off, not least because of the grinding that it infers, yet there’s an almost a perverse kind of addiction to getting all this loot (as no doubt Ubisoft has intended), and gradually making my fleet of vehicles more powerful soon revealed itself to be a hugely compelling pursuit (though granted, not everyone will feel this way). 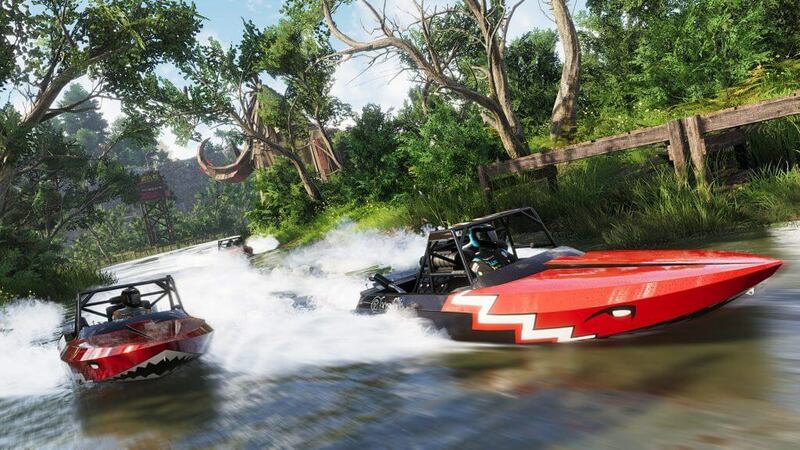 When it comes to the handling of these various vehicles, The Crew 2 very much embodies a bespoke feeling of weight, heft and physicality that really hasn’t been seen in a while. The cars in particular have that Grand Theft Auto feel to them where each one palpably seems like a solid entity that reacts with the sort of explicit real-world feedback that one might expect from every little turn and every little adjustment you make as the driver. Whether you’re competing by land, air or sea, driving vehicles in The Crew 2 simply feels bloody fantastic. When not rooted to the ground, The Crew 2 still manages to ably impress in both the air and sea domains. Where things fall apart a bit here is in how the world reacts to you when you’re bombing around its domain. Largely, the inconsistent physics are to blame for that disconnect as you can tear through lampposts, fences, telephone boxes and more besides, but if you happen hit a skinny tree or a rogue knee high wall, you stop absolutely dead – something that presents itself as a real, frustrating problem when you’re racing through dense environments that possess such elements. 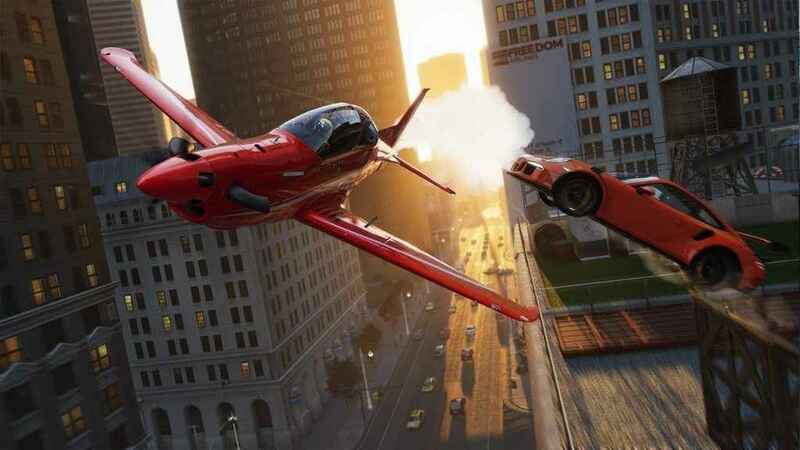 Beyond its extensive selection of different racing events, The Crew 2 continues the sprawling and expansive freedom of the previous game by allowing players to scoot across a scaled version of the US and basically do whatever they like, whether that’s hooking up with random events, taking photos of wildlife or just co-opting the states as their own personal playground. 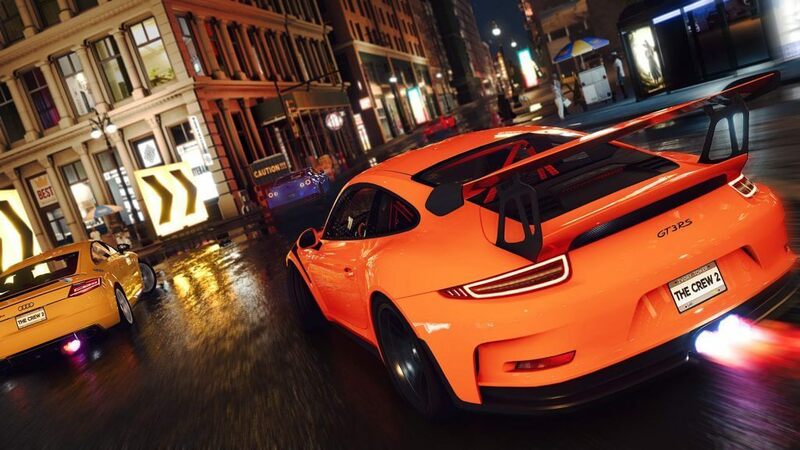 Certainly, when it comes to the credit and follower boosting photography, ultimately such diversions not only serve as apt distractions from The Crew 2’s decidedly competitive core, but also work as neat incentives to play within the vast open world apparatus that developer Ivory Tower has painstakingly fashioned. Where this massive, ad-hoc playground comes unstuck is in how occasionally flat it can all seem. From the towering Utah mountains to the urban sprawl of downtown Los Angeles, between the respective lack of population in the latter and the oddly low quality of flora and fauna in the former, it can certainly seem that The Crew 2’s depiction of the United States is far less busy than it should be. 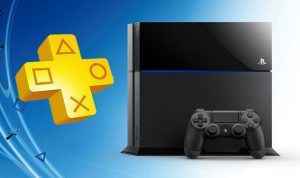 Nonetheless, there’s no denying that The Crew 2 can be a very attractive game indeed – from stunning sun kissed, rain streaked streets, to some of the best water animations and visuals I’ve seen in recent times, Ivory Tower have crafted an ultimately opulent affair that shines even brighter when played on PS4 Pro. The Crew 2’s scintillating boat races are great fun indeed. Elsewhere, it’s clear that The Crew 2 requires a little more polish than that which it was given on release. From the odd crash to a smattering of minor bugs, (one of which stops a drift race from ending when the timer hits zero), there is obviously work to be done to iron out the numerous rough edges that The Crew 2 has, but if we’ve learnt anything from Ubisoft it’s that they tend to like their patches more than Ric Flair likes taking folks to Space Mountain, so we can certainly take some solace in that. More than the sum of its parts, the uneven level of polish and oddly sparse environments don’t detract meaningfully from a game that provides an almost endlessly tantalizing buffet of well-engineered motorsport, water and aerial challenges. By providing such a truly varied pick and mix of racing disciplines that takes in everything from street racing, motocross and monster trucks, through to speedboats, airplane stunts and beyond, Ivory Tower should be commended for not only providing such bountiful choice, but also in refusing to sacrifice quality across those numerous automotive pursuits. Boasting more content than most long form RPGs, The Crew 2 arguably fares much better when taken as a straight racer, rather than an exploratory odyssey. As such, it’s within the confines of the masses of tightly knit and well engineered racing challenges, not to mention within the rewarding progression systems that the Crew 2 truly shines – just make sure you have your block button ready for all that shoehorned social media garbage. The Crew 2 is out now on PS4, PC and Xbox One. If you enjoyed this review of The Crew 2, you might want to check out our feature that collates the best racing games you can get on PS4 right now. The Crew 2 code provided by the publisher. 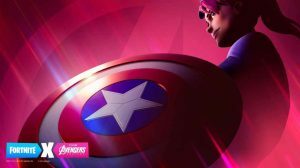 An avalanche of racing goodness, hokey social media anchoring and an oddly sparse open world aren't enough to prevent The Crew 2 from improving on the original in every way and providing a multi-disciplined racer that is quite unlike any other on PS4.